Our elected reps look at the number and distribution of noise complaints as support for their efforts to get the FAA to make changes. Many neighbors who are disturbed by the noise and pollution do not realize that complaining is vital to this process. Moreover, many do not appreciate the clearly documented effects of our level of airplane noise on health, learning and productivity. You can help by discussing these points with your neighbors and community groups. Here are some materials that might be of assistance. Feel free to download, print and distribute widely. This is a one page flier that gives a brief overview of the situation and how to approach solving it. Here are some myths dispelled and answers to some Frequently Asked Questions. This is a referenced one page fact sheet that gives more details about the situation. 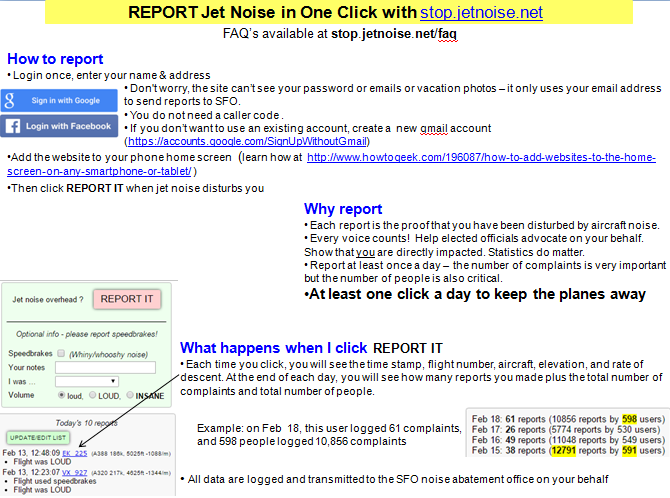 Here is a detailed explanation on how to report aircraft noise in one click through stop.jetnoise.net. The program can be accessed via a browser on your smartphone, iPad/tablet, or laptop. Here is some info in Spanish. 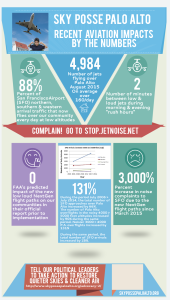 This is a comprehensive and up to date summary of the effects of aircraft noise on health, sleep, learning and memory. It is published by two British noise groups. Highly recommended! If you dont have time to read all this, here is an excellent short summary. This is a brief explanation of some of the terms used to measure noise. California uses CNEL but this measure is obsolete and needs to be replaced. Here is a nicely illustrated bifold FAST FACTS brochure prepared by our friends in Los Altos. It summarizes the problem in brief bullet points and describes what can be done to help.